OK with limited seating but there always seems to be a massive takeaway queue here. sNc from Wales. Sent 26 Jun 2012. Too many times to mention! I always stop by here for the Mr.Nice, Budha, Sensi Star. Great smoke but no smoking inside. Profalbern from Germany. Sent 30 Mar 2011. Very satisfied! First impression is it's clean and ordered and smells like some great weed. Friendly, helpful staff; I only bought 25 Euro of 'Laughing Budda' but they asked me whether I'd like a complimentary pack of rolling papers with it and I could choose from all the kinds they had. First time that I've been to a coffeshop in which you're not allowed to smoke, but this example shows that maybe it's better that way. Steve from Scotland. Sent 14 Apr 2009. This shop opens at 4pm and it is right on the street. The guy behind the counter was great, I decided to buy a pre rolled joint of Haze and was shocked to find that I couldn't smoke inside and was directed outside. This did not impress me but rules are rules. Outside there was a crowd of about 8 people who all seemed to know each other, however one guy who went into the shop got hassle on his way out and words were exchanged. This made me uneasy so I went back in the shop after my smoke and spoke to another bud tender who was great with advice. I took a bag of DNA at 10 euros and left. The haze was a great joint as it made me buzz and the DNA is well worth a try for anyone who likes a heavy stone. A pretty smokefull coffeeshop that don't look very well and the shoppers over there was not very nice but OK. But the Crystal Hash they sold me was one of the best hash I smoke in that vacation. Fiddilydee from Canada. Sent 31 Jul 2006. This place was the first I went to and the best, I just asked for what was good and I got White Widow and some kind of bubble hash, both were awesome. They had screens with various pictures of buds. Guy was very friendly, way more than the others. Being the first one I seen this place set the standard and sort of made the others disappointing. Big Bomb from Scotland. Sent 13 Jul 2006. 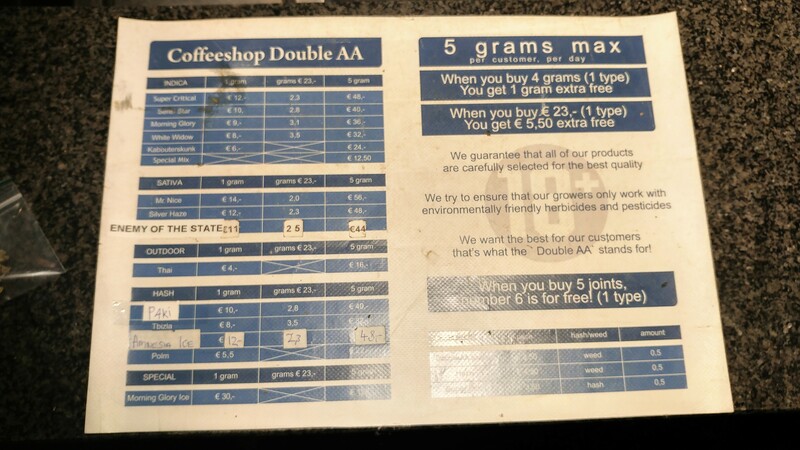 Good coffeeshop, good selection of both grass and weed, go for the Shiva at 25 euros for 5 gramme, That's a great smoke at the non rip off Amsterdam prices. Remember the coffeeshops in Leiden don't open till 4pm, helpful staff and well displayed menu, good location. BAC from Netherlands. Sent 11 Jul 2005. Hash: Manali Cream 12 euro 1g, 23 euro 2.5g; Dealers Dope 9 euro 1g, 23 euro 3.1g, 36 euro 5g; Nepal ditto; Tbisla ditto. BAC from Netherlands. Sent 21 Aug 2004. Definitely one of the best coffeeshops in Leiden. Found in the coffeeshop "area", since all coffeeshops in Leiden are all close by. It has one of the greatest weeds in the South Of Holland called Morning Glory. The taste and effects are great, but the price is a bit discouraging (9 euro/gram). They have various weeds and hash. The staff is very friendly, seating is good and comfortable, it has the same menu as 1ste Kamer, and is found just one street away from it. I enjoy my visit here, and I definitely recommend a trip to Leiden. Pieter from Netherlands. Sent 3 Apr 2004. The shop is nice, the people that work there are very nice. Nice to speak to and the stuff there is good and the seating there is comfortable.